The last couple years have been very exciting for Auto Geeks across the board with the introduction of permanent and semi-permanent paint coatings, glass coatings, trim coatings and even wheel coatings. Paint coatings provide far greater protection than a conventional car wax or paint sealant. While a typical car wax or paint sealant wears off after a couple months, a paint coating forms a much stronger, harder bond that can withstand the elements to a much greater degree. Paint coatings, especially Optimum Gloss-Coat, are resistant to alkaline cleaners, road salts and other harsh chemicals that can find their way from the road to your vehicle’s delicate finish. The secret to these high-tech paint, glass, trim and wheel coatings lies within advanced chemistry. Most paint coatings are resin or quartz based. When compared to a traditional car wax or paint sealant, a paint coating forms a much harder, thicker layer of protection, enabling them to last considerably longer. Most paint coatings last a minimum of one year while others, like Optimum Gloss-Coat, are semi-permanent and only need to be re-applied every couple years. 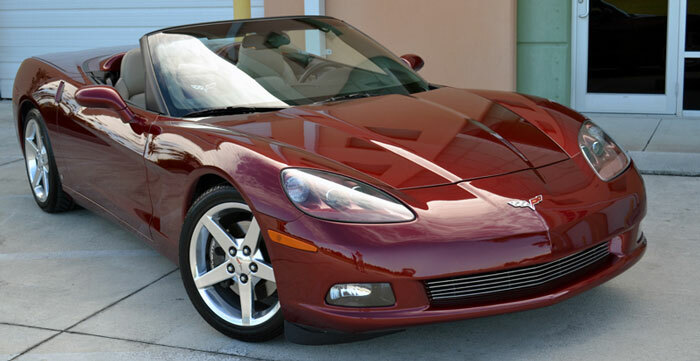 The owner of this beautiful Crystal Red Corvette Convertible shows off the shine and protection created by coating with Pinnacle Black Label Diamond Surface Coating. The highly reflective, glassy shine created by Diamond Surface Coating will last up to 3 years. What about the shine? Paint coatings, notably Pinnacle Black Label Diamond Paint Coating, Wolfgang Uber Ceramic Coating, and GTechniq EXO are not lacking in the shine department. Paint coatings provide a different type of finish; your vehicle’s paint will have a glassy, reflective shine that emits crisp, clear reflections. What’s more, paint coatings have a self-cleaning effect so dirt and debris will not stick, making washing much easier. Your vehicle will stay cleaner, longer! The key to success with any paint, wheel, or glass coating is a properly prepped surface. Start off by claying the vehicle using Pinnacle Ultra Poly Clay. This step removes above-surface contaminants including rail dust, paint overspray, industrial fallout, bugs, etc. The next step is to polish the surface, and for this crucial step we recommend Pinnacle Black Label Surface Cleansing Polish. This step is the most important step in coating your vehicle as it removes contaminants, oils, and fillers that would otherwise prevent the coating from bonding. Black Label Surface Cleansing Polish is a water-based polish that leaves the surface prepped and ready for application of your favorite paint coating. Whether you’re a professional detailer looking to offer a paint protection service that lasts longer than a conventional car wax or paint sealant, or simply someone that only wants to detail their car once every couple years, a paint coating is the perfect alternative to a car wax or sealant. BLACKFIRE Paint Prep 32 oz. BLACKFIRE Pro Primer Polish 32 oz. BLACKFIRE Coating Booster 32 oz. IGL Ecocoat Window Kit 60 ml. GYEON Q2 Pure 30 ml. GYEON Q2 One 30 ml. Optimum Opti-Lens Permanent Headlight Coating Free Bonus! GTechniq C2v3 Liquid Crystal 500 ml. GTechniq G1 Clear Vision Smart Glass 15 ml. GTechniq G1 Clear Vision Smart Glass 100 ml. GTechniq C4 Permanent Trim Restorer 15 ml. GTechniq C5 Wheel Armor 15 ml. GTechniq G5 Water Repellent Coating 100 ml. Sonax Polymer Net Shield 340 ml.